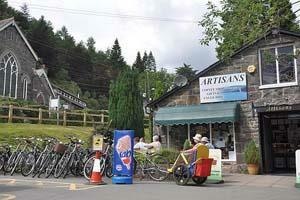 Artisans Cycle Hire at Artisans01691 870317work Cycle HireWelcome to Lake Vyrnwy. One of the best kept secrets in Mid Wales. If you enjoy walking, cycling, bird watching or you just want to relax, Lake Vyrnwy is a good place to start. Once you're here, Artisans Coffee shop is worth a try. We can provide you with food & drink, ranging from a cappuccino to a delightful hot chocolate or if you are feeling a bit peckish we offer a wide selection of food including hot toasted baguettes or our very popular carrot cake. Artisans also hire bikes for the more energetic who want to take on the 12 miles of road around the lake. With a good selection of gifts as well, why not make us your first stop? Welcome to Lake Vyrnwy. One of the best kept secrets in Mid Wales. If you want to find us we are in the car park opposite the RSPB Visitor Centre. After crossing the dam (from Llanfyllin B4383) turn left. Turn first left after 50 yds. Artisans can be found in the car park directly opposite the RSPB Visitors Centre.